BCB Transport is offering big miles with flexible Money Lanes in the Central New Jersey area going to the Sunny SW and SE. These Money Lanes are with reputable top shelf customers giving you excellent revenues for your family. TEAMS MAKE EVEN MORE AND ARE ENCOURAGED TO APPLY! Up to $0.65 per mile with quarterly incentives. Great place to work with a strong family culture! BCB Transport Health Coverage It’s All About Choice! 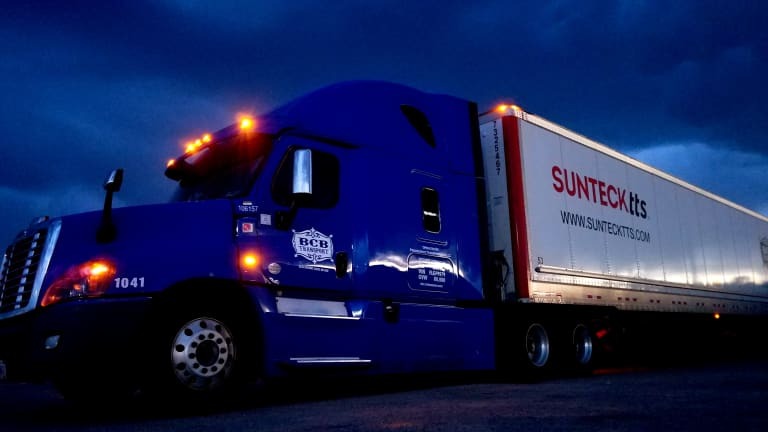 As a company driver at BCB Transport; you are our #1 asset, and your dedication and enthusiasm are the primary factors contributing to our ongoing success in the Trucking Industry. While we continue to see health care cost increase in the marketplace, our HR team has worked diligently to deliver affordable coverage to our BCB driver family. We offer multiple plans through our carrier Tall Tree Medical that will satisfy your requirement to maintain qualified health coverage and avoid tax penalties. In fact, BCB is providing the MEC coverage at no cost to you. If you wish to have additional coverage/benefits, you have the option to “buy up” on plans for you and your dependents. Also available is our Telemedicine program via Healthiest You – which is also included at no cost if you elect coverage under one of our Tall Tree plans. This is a reliable program you can utilize when you are away from home and in need of immediate care for typical primary care services. BCB Transport will continue to offer a variety of voluntary choices for Medical Dental, Vision, Long Term and Short-Term Disability, Accident, Critical Illness, Cancer and Life insurance programs through our various providers. Learn more about our healthcare coverage here. Driving Experience – Must possess at least two (2) years of verifiable tractor-trailer driving experience within the past five (5) years. Specialized Operations: Require at least 2 years verified Reefer &/or Flatbed operating experience within that past 5 years. Military Veteran Exception: Minimum 1 year of verifiable tractor-trailer driving experience with a motor carrier within the past 2 years. Must have valid DD-214 & honorable discharge. Must be approved by Suntecktts Safety Management. Driving Record: Accidents – No more than three (3) minor preventable accidents within the preceding three (3) years. No involvement in a preventable DOT recordable accident in the past 12 months. Note: Any accident may disqualify an applicant based on the circumstances and severity. Driving Record: Citations – Driver may not have more than two (2) moving violations in the past three (3) years. Driving Under The Influence – Individuals convicted of DW I, DUI, (driving under the influence of alcohol and/or a controlled substance), while operating a commercial or private motor vehicle, will be disqualified if occurrence was within the last ten (10) years. In addition, refusal to submit to an alcohol or controlled substance test, will be disqualified if occurrence was within the last ten (10) years. You are required to provide original copies upon your date of hire and no later than 3 business days from your date of hire proving your identity and eligibility to work in the US. Only original documents will be accepted. Click here to see a list of acceptable I9 documents. BCB Transport is an equal opportunity employer and uses E – verify to confirm employment eligibility of newly hired associates. To learn more about E-Verify, including your rights and responsibilities, click here. At BCB orientation is divided up into (2) segments. Segment 1 is our online orientation; which is completed prior to Segment 2 our classroom orientation. Below is a brief description of each segment. Prior to attending Orientation at our Mansfield TX or Carlisle PA facility, it will be necessary to complete our online safety orientation. This online instruction consists of (20) short videos. At the end of each video your will be asked to pass a short quiz consisting of a few questions that may be either multiple choice or true and false. While the online safety orientation does take approximately 3.5 hours to complete; it is not necessary to complete all 20 videos at once. Instead, you may choose to complete your video assignments in segments that are convenient to your schedule; prior to attending orientation. The online orientation videos are provided by Vertical Alliance, a third party online training and safety platform for the Transportation Industry. All new drivers who join BCB must complete the online orientation and pass a drug screen prior to attending orientation in either Mansfield TX or Carlisle PA.